This free Bible lesson is part 4 of 10 in our Lord’s Prayer study. The theme of God’s name and holy character is introduced. All proper prayer is deeply respectful to God. Click here to browse all the lessons and related ideas. 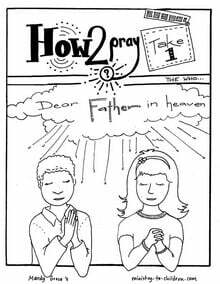 Don’t miss our printable Lord’s Prayer coloring book, use it as an additional activity while teaching this unit. Main idea: God is perfect, and as Christians, we must act in such a way that keeps his reputation good in the minds of people who don’t know Him. Read Scripture references and Amos 2:6-8, Micah 4:1-7, 2 Timothy 2:14-19, Psalm 113, Philippians 2:9-11. Gather: Bible, index cards, ribbon, hole punch, scissors, markers or crayons, dry erase markers or chart paper and markers. Write “may your name be kept holy,” (Matthew 6:9b, NLT) on a regular sheet of paper. Make sure it takes up the whole page, so it can easily be read. Fold it up and place it in an envelope. Take time to meditate on this week’s Scripture and think about your own life. How do you respect God’s reputation? Do you think, speak, and act in ways that show you love God? As you consider hallowing God’s name, be careful not to think that God somehow needs us to keep his reputation pure. God is strong enough to keep his own name holy. Our role in hallowing his name is a matter of our own sanctification. We say we follow God, so let’s act like it! See http://christianity.about.com/od/biblestudyresources/qt/namesofgodjesus.htm for a list of many of the names of God, along with Scripture references. If you have the time and interest, do some research on the effect of names. Studies show that our names affect how society views us and even the careers we choose. Action Name. Have all the kids stand in a circle facing in. Each person says their name and comes up with a simple action that they feel describes them well. After everyone has a chance to say their name with their action, go around the circle and repeat them. Except his time, you have to repeat the names and actions of everyone who went before you before you say your own. With younger kids, help remind them of the actions of previous kids. For older kids, you could have them be out if they miss a name. Last week we started to learn about a very special prayer that Jesus used to teach his disciples how to pray. Does anybody remember what we call this prayer? The Lord’s Prayer, that’s correct! Last week we looked at the first part of this prayer. We are going to work over the next several weeks to memorize this prayer. Who memorized the first part of the prayer, that we learned last week? “Our father in heaven.” That’s right. Last week we learned that God is the King of heaven, and we are his children whom he loves very much. So in the Lord’s prayer, we are talking to God. Let’s open up today’s special message from God. (Pull out the envelope you prepared earlier. Either open and read it yourself or have a student do so.) Today’s special message is “may your name be kept holy.” Whose name is to be kept holy? God’s. God is holy, perfect, or set apart from everyone else. Today we will look at what it means for God’s name to be kept holy in our own lives, and by next week, we will have this part of the prayer memorized. First, let’s think about names. In today’s game, we had to memorize the names and actions of everyone in our group. It was kind of tricky, wasn’t it? But didn’t it feel great when someone remembered your name and the action that you chose to represent who you are? Our names are special and important to us, and it feels good when people remember our name and use it often. Another way to look at names is to think of the different names we have to different people. Some names represent different roles we have. For example, I am your teacher and you are my students. You may also be daughters, sons, brothers, sisters, baseball players, musicians, or artists. We may call our parents Mommy or Daddy. This isn’t the name their parents gave them, but it’s still a very important name. I am sure that your parents love it when you call them Mommy or Daddy. Mom or Dad is a job, a reputation that they have. A reputation is a way people view you. I view you as students, so I expect that as students, you will listen and learn something from me, your teacher. As we study the Lord’s Prayer, all of our games and crafts will be related to communication, because prayer is all about communicating. Today we are making I.D. Badges. Many jobs have identification badges showing a picture of the employee, their name, job title and sometimes security clearances. Our I.D. badges today will be very simple. Each child will get an index card with a hole punched out near the top and a length or ribbon to make a necklace. After explaining what an I.D. badge is to the kids, take them through the following steps to make a badge. At the very top, write your name. Along the left, draw a picture of your face. Along the right, add your nickname, your favorite Bible verse, your favorite food… etc. Color the border of the I.D. in your favorite color. Tony Kummer (Editor) reviewed & updated this page on : December 8, 2013 at 9:55 pm. All our content is peer reviewed by our readers, simply leave a comment on any post suggest an update.